With the Afghanistan war covered more in the news in regards to the perceptions of the war on the home front than the action overseas I found the documentary Restrepo, the 2010 release that won the grand jury prize for best documentary at this year's Sundance Field Festival held this past January. 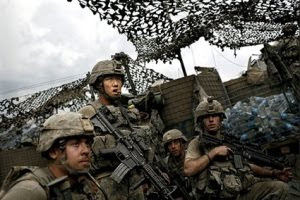 Restrepo is directed by American journalist Sebastian Junger and Tim Hetherington. Sebastian Junger made a name for himself when he wrote The Perfect Storm: A True Story of Men Against the Sea, a book about a fishing boat and it's crew members off the coast of Nova Scotia. This book was later adapted to film. In Restrepo, Sabastian Junger is a hidden narrator telling his story strictly through the words of soldiers and images of a year spent in one of the most dangerous areas of Afghanistan during 2007, the Korangal Valley. As he follows a single platoon, this film puts legs on the high degree of fighting that one portion of the military is engaging in. It's shocking to watch this as these soldiers are literally being fired on every day and engaging in combat. The film presents itself with little commentary, and it seems pretty clear that Junger is not trying to push an agenda, but instead present a journalistic perspective on one of the fiercest fire fights out there. The film's title comes from the name of a member of the combat team who is lost early in the film, and as a result becomes the namesake of an outpost that is built that will go on to bear his name. When Outpost Restrepo is shown being built in this film, it is a powerful and amazing thing. I have not seen modern images of the conflict in Iraq or Afghanistan like this and for that reason alone I highly value having seen this documentary. The documentary isn't a popcorn flick, instead it mirrors much of the intensity that was present in the film The Hurt Locker, except the difference is this footage is real. The images and reality are sometimes hard to stomach but it's hard to criticize reality or the bravery of these soldiers. This film is also one of the fifteen films shortlisted for an Oscar nomination for best documentary, but beyond the awards race, this film is an important journalistic piece and I think while perhaps difficult to watch, has immense value. Thank you Junger and Hetherinton for making this film. This knowledge about StrangeCulture Blog is very helpful for me! Appreciation for giving out. it’s all very fresh and clearly written!